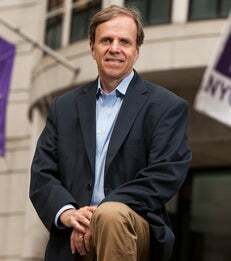 The NYU Stern Center for Business and Human Rights is located at the Leonard N. Stern School of Business at New York University. Michael Posner serves as the Director. He and Sarah Labowitz co-founded the Center in 2013. The Center offers classes, conducts research, and carries out projects on current business and human rights challenges. The Center takes on the most pressing issues at the intersection of business and human rights. Global companies are central players in either improving or eroding respect for human rights. This is especially true when they operate in states with weak institutions and rule of law. In each aspect of our work, our focus is on how companies address human rights challenges in their core business operations.We start from the premise that sector-specific approaches to improve human rights make companies more sustainable, predictable, and profitable over the long term. In our view, it is not enough for each company to be on its own "journey" when it comes to human rights; standards are needed to set and measure expectations of companies. The Center maintains a full-time staff in New York. It is located within the Business & Society Program, headed by Professor Bruce Buchanan. Funding for the Center is provided by NYU Stern, foundations, and individual donors. The Center's Advisory Council meets annually and provides strategic guidance to its activities.